The long-awaited and much anticipated trial challenging the legality of plans to dump over 100 million tons of waste from the Ramu nickel mine in Papua New Guinea into the sea will begin in the National Court on February 8. A previous trial, which had been scheduled for September last year, was abandoned when the four plaintiff’s withdrew citing fear and intimidation by mine supporters. But since then the case has been taken up by around 100 new plaintiff’s representing 1,000’s of people from along the Madang coast and islands. These local people claim the proposed dumping will cause environmental damage that will impact on their subsistence lifestyles. The Ramu nickel mine is majority owned by MCC, a Chinese State enterprise, with Australian based Highlands Pacific a junior partner. MCC is also facing contempt of court charges over allegations it has tried to intimidate the new plaintiff’s to give up their court battle. One mine supporter has already been sentenced to 12 months imprisonment for his role in trying to intimidate witnesses and lawyers. 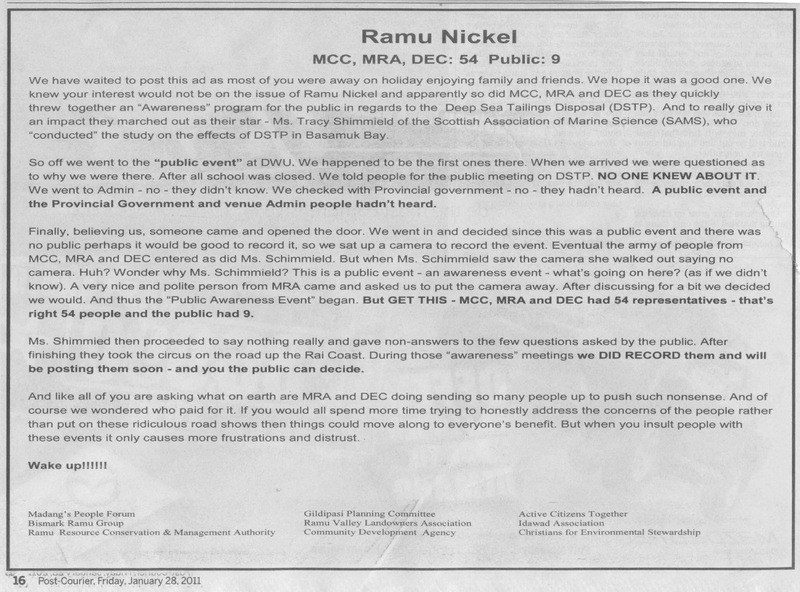 Local groups in Madang, Papua New Guinea, have published newspaper adverts deriding the government’s attempts to conduct ‘awareness’ workshops on plans by the Ramu nickel mine to dump over 100 million tons of mine waste into the sea. 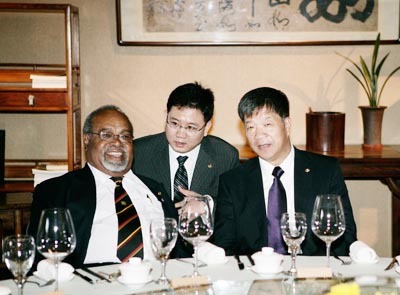 The Ramu mine is owned and operated by MCC, a Chinese state owned corporation, with Australian based Highlands Pacific a junior partner. A court case to determine the legality of the marine waste dumping plans is due to start on February 8. 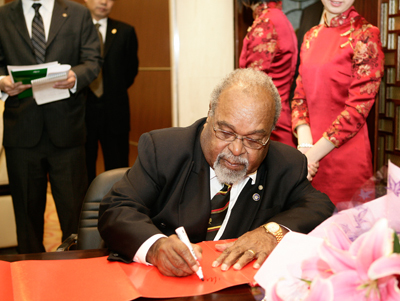 Papua New Guinea Prime Minister, Michael Somare, has been resolute in his support for the controversial Ramu nickel mine, despite all the crisis faced by the project, and has not said one word in support of local people who have suffered all the negative consequences from the mine and its implementation. The script below from the website of MCC, the mines owners, and the accompanying photos perhaps show where his allegiances lie. 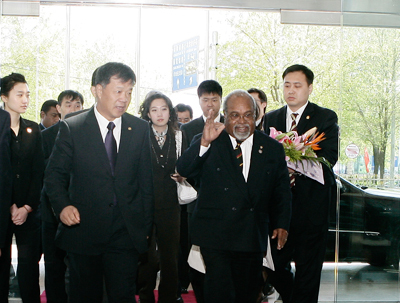 Prime Minister Michael Somare of Papau New Guinea paid a visit to MCC Group upon invitation on April 15, 2009. Shen Heting, Vice Chairman & Party Secretary of MCC Group and President of MCC Limited extended a warm welcome to the Prime Minister and his delegation. 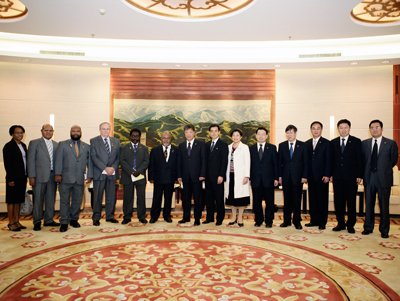 Both parties held fruitful discussion on implementation of Ramu nickel mine and cooperation in the other fields. President Shen stated that, MCC Group was to further accelerate the project implementation and put it into commissioning as soon as possible. 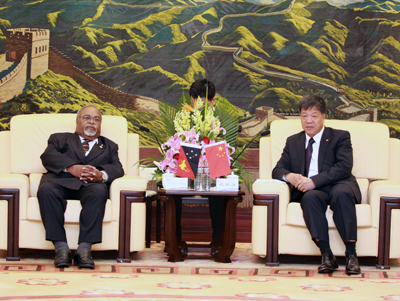 The Prime Minister said, as the largest foreign-funded project in the history of Papua New Guinea, Ramu Project has been progressing well since its commencement and played an active role in the economic and social development of the host country, therefore the Government of PNG appreciated and reciprocated for the endeavors taken by MCC Group. 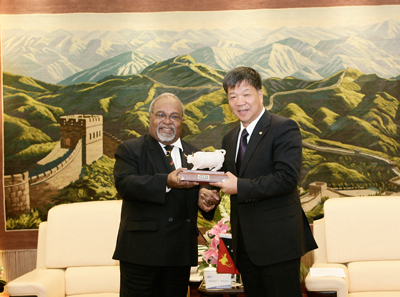 He promised that, he and his Administration would continue to offer great support to the execution of Ramu Project. During the meeting, both parties talked extensively on measures to be taken by PNG Government for resolving some issues about the project implementation, and entered into agreement on further and closer collaboration in the other aspects. The Papua New Guinea government has given the green light for the what is hoped to be world’s first sea floor mining venture. It has granted a 20-year mining lease to Canadian company, Nautilus Minerals, to mine gold and copper in a 59 square kilometre section of the Bismarck Sea. The Solwarra one site, as it is known, is off the coast of New Ireland province and about 50 kilometres north of Rabaul. GARRETT: The grant of the mining lease was the last regulatory hurdle Nautilus Minerals had to clear. Nautilus CEO Stephen Rogers says it is an historic decision. ROGERS: As this industry emerges it is going to present a significant contribution to the PNG economy. GARRETT: Earlier this month you had more drilling results from Solwarra One. Just how much gold and copper is there and how much do you plan to produce once mining gets underway? ROGERS: At the moment we have an indicated and inferred resource. Combined it totals around 2 and a quarter million tonnes, approximately, of ore. When we go into production we would be producing at approximately 1.3 million tonnes per annum and that should generate something of the order of 80,000 tonnes of copper per year and approximately 150,000 to 200,000 ounces of gold, each year as we go forward. GARRETT: That will make Nautilus a significant player – producing about half as much copper as the giant Ok Tedi mine and the same gold as an average small operator. The grant of the mining lease was delayed while the PNG government considered if it will exercise its option to take a stake in the project of anything up to 30 per cent. Now the lease has been granted it has just 30 days to make a decision and find the finance. I asked Stephen Rogers what it would cost PNG to take its full option. ROGERS: Any capital that we have to put into the project, going forward .. the government would have to put up its 30% share. Initially, it has an outlay of approx US$20-25 million which represents the investment costs to date on the exploration, the environmental work and the development work, that has been carried out so far on the project. GARRETT: What is your understanding of what sort of stake the PNG government is considering? ROGERS: I wouldn’t like to second guess the government but I am of the opinion that they will certainly participate. GARRETT: As the project is offshore you don’t have to deal with landowners. Does that mean PNG and its citizens will not get as much income from deep sea mining as it does from mining on land? ROGERS: Not at all. The same opportunities exist for people to participate in this project by providing services to the company, and in terms of the royalties going back into the country, they are exactly the same as any land-based mine. So while we are not impacting people and having to move them from their homes, the general benefit back into the country is very similar. GARRETT: How soon do you hope to be able begin commercial mining? ROGERS: Once we sanction the project – which means our board has to approve it – then we’ll be about 30 months before we go into production. We have one more milestone to put in place after this particular one: we are intending to close out an arrangement with a strategic partner which will bring in the additional capital that we need to take the project through to commissioning and into production. We hope to do that in the near future and once that milestone is achieved then our board would approve the commencement of the building of the equipment. We are well advanced in the engineering aspects of all of this equipment and we are now very close to the stage where we will start to assemble all the different components necessary to start offshore production. GARRETT: Stephen Rogers CEO of Nautilus Minerals. Mr Rogers is bullish about the future of seafloor mining and he believes the Pacific will lead world. ROGERS: We’ve had considerable success in the Bismarck Sea, with 19 different systems discovered to date. Over and above that, we’ve carried out exploration in the territorial waters of Tonga, and we have large tracts of land right across the Western Pacific in countries like Fiji, New Zealand, Vanuatu and the Solomon Islands. GARRETT:: So what potential do you see in the longer term for this industry in the Pacific? ROGERS: We have a view in the company that the seafloor industry has the ability to provide the world’s copper supply. We don’t have hard evidence of that at this point in time. But based on what we do know about the location of these seafloor massive sulphides around the world and the intensity or diversity of systems that we have seen in this one area of the Western Pacific, we apply that across the world – the experts tell us that there could be many thousands of systems with the ability to provide the world’s copper demand. The court action faced by Harmony Gold’s subsidiary in Papua New Guinea was not surprising because most mining companies tended to overlook the effect and consequences of their activities on surrounding communities, said John Capel, CEO of a sustainability monitoring NGO, Bench Marks Foundation. Harmony Gold and its Australian partner seem to have landed in hot water after trying to pay their way out of environmental damages attributed to their operation in Papua New Guinea. The JSE-listed gold miner released a statement last week saying its mining operation in Morobe Province of Papua New Guinea, faces possible court action over sediment spillage from its Hidden Valley Mine joint venture. The sediment discharge seems to have caused environmental damage for communities along the Watut River. These damages include possible contamination of crops and home gardens. Led by a parliamentary representative of the Bololo community and a number of land owners, the court action defies an arrangement whereby the operation called Hidden Valley Mine was to settle the matter through financial compensation to members of the affected communities. Countries like Papua New Guinea probably had far less mining regulation compared to South Africa and were likely to see such conflicts emerging between prospectors and communities, he said. “At stake is the communities’ way of life, kinship relations, cultural traditions, livelihoods and subsistence and agricultural farming,” he said. Capel said mining companies “need to go beyond reporting and implement ethical standards that govern their relations with communities and ensure measurable local development indicators”. “Much is said about the need to attract foreign investment and the benefits of mining, job creation, contribution to GDP and overall economic benefits associated with the extractive industries. Little is said about the negative impact on communities,” he said. The joint venturers would vigorously defend the litigation should it proceed, said the Harmony statement. “The writ alleges nuisance relating to mine-related sediment and seeks damages and injunctive relief in relation to the Hidden Valley Mine operations,” said the statement. The statement added that the writ was contrary to the agreement reached between the community and the joint venture, to resolve the matter “in a transparent and co-operative forum”. The payments were for flood damage to crops and gardens to which mine-related sediment may have contributed, along with natural events like land slips and major rain events, said the statement. The owners of the Hidden Valley gold mine in Papua New Guinea have put out a series of contradictory statements over the pollution of the Watut river system. While the mine owners, Australian Newcrest Mining and South African Harmony Gold, have previously admitted pollution and sedimentation problems and have been making voluntary nominal compensation payments to affected families, they are now trying to deny causing any nuisance and say they will vigorously defend litigation brought by local people (see below). Perhaps someone should try giving the miners some legal and public relations advice. If they accept the mine has caused pollution and sedimentation, which they already have, then, in law, that constitutes a nuisance – and they can’t now deny it! And saying they will vigorously deny a legal claim when they have already admitted the pollution and sedimentation problems smacks of the worst kind of human rights and environmental arrogance: international mining companies trying to use their financial muscle and teams of top-flight lawyers to deny justice to hundreds of indigenous people. A much more plausible and defensible response would be for Newcrest and Harmony to admit the legal claim and to sit down with the local people to sort out proper remediation, adequate compensation and a series of safeguards to ensure no repeats. Come on guys – do the right thing for once! The Hidden Valley Joint Venture denies allegations made against it in a writ purportedly served upon the PNG Joint Venture companies late yesterday by the legal advisor acting for the Member of Parliament for Bulolo and a number of customary landowners living along the Watut River. The Joint Venturers will vigorously defend the litigation should it proceed. The writ alleges nuisance relating to mine-related sediment and seeks damages and injunctive relief in relation to the Hidden Valley Mine operations. The issue and purported service of the writ is contrary to the agreement reached between the Member and the Joint Venture (jointly publicly announced on 6 December) to establish an expert technical advisory panel as a vehicle for constructive resolution of sediment related issues in a transparent and cooperative forum. The pending legal action now prejudices the ability of the Member and his legal advisor to participate in this process. The issue and purported service of the writ by the Member’s legal advisor appears to be prompted by voluntary compensation payments being made by the Joint Venture to communities along the Watut River. The payments were for flood damage to crops and gardens, to which mine related sediment may have contributed, along with natural events including land slips and major rain events. These payments have been underway since November and are now almost complete. The vast majority of eligible people have now received their payment. The Member has been fully aware of the status of the payments throughout the payment period. Additionally, in mid December the Joint Venture formally confirmed with the Member and his legal advisor, that by accepting these compensation payments landowners do not in any way infringe on their future rights to claim further compensation. Importantly, at Hidden Valley Mine all tailings from the processing of ore are stored permanently in an engineered Tailings Storage Facility. No tailings are discharged from our site. Hidden Valley Mine has a demonstrated track record of working with communities. A range of effective environmental and community programs are in place and ongoing. The Hidden Valley mine has a 2000-strong workforce, most of whom are local people. The Joint Venture remains committed to addressing issues with affected communities in a constructive and expeditious manner. Shares in Australian Newcrest Mining dropped 56 cents this morning. The share lost 1.5% of their overnight value on news that the Hidden Valley gold mine in Papua New Guinea is being sued by affected communities for environmental damage to the Watut river. The Hidden Valley mine is jointly owned by Newcrest and South African Harmony Gold. While Newcrest says it will vigorously defend the court action it has already admitted there are sediment and pollution problems in the Watut river and made some low-level ex-gratia payments to affected families.